From textile mills to the state’s mental hospital, a team of UNC faculty, students and staff are engaging with North Carolina communities to tell their own complicated stories. In spring 2016, at an open house for the history center that documents the story of the Loray Mill in Gastonia, a “movie” was about to start and folks were lining up for a seat. The 1,100-square-foot history center and accompanying Digital Loray online exhibit are part of the largest public humanities project ever undertaken by UNC-Chapel Hill, through the work of the Digital Innovation Lab. The refurbished textile mill has been transformed into modern apartments, offices and stores. On the wall of the history center is a series of huge arched windows, with each one divided into 12 mullions that create individual “projection spaces” for showcasing hundreds of still and animated images of life in the mill since 1902, said historian Robert Allen, the James Logan Godfrey Distinguished Professor of American Studies, who spearheaded the Loray project as co-founder and director of the digital lab from 2011 to 2016. He has been teaching at Carolina for 38 years. Allen grew up a short walk from Loray (later Firestone Mill), and both sides of his family worked at the mill a century ago. He is aware of the role textile mills played in hundreds of communities in the region and the sense of loss created by their closure since the 1980s. 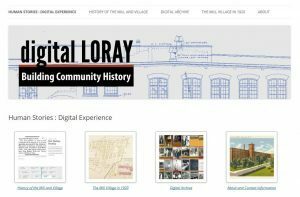 The Digital Loray online exhibit is part of the largest public humanities project ever undertaken by UNC-Chapel Hill. A promising avenue for this type of university outreach, he concluded, was to work with preservation organizations, local museums and libraries, property developers and partnering UNC-Chapel Hill units to make the adaptive reuse of iconic sites into catalysts for intensive community history initiatives. 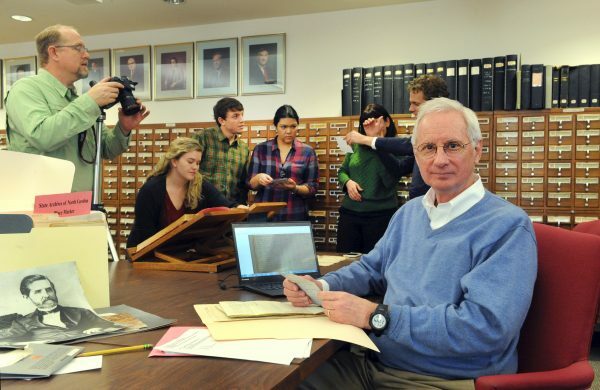 Today he leads an enthusiastic team of undergraduate and graduate students and archivists who are taking the lessons learned in Gastonia to create public humanities projects that will illuminate pieces of a community’s past in Rocky Mount, Raleigh and beyond. The historians are part of the Community Histories Workshop, or CHW, housed in the College of Arts & Sciences’ Center for Urban and Regional Studies. Rocky Mount Mills, the second-largest and longest-running textile mill in the state, closed its doors in 1996 after 178 years of operation. Capitol Broadcasting Company is developing the mill into a multiuse project, with loft apartments, offices, restaurants and more. About 60 mill houses are also being renovated. Supported by an initial grant from Capitol Broadcasting, the CHW began work in October 2016 to recover the complex stories of Rocky Mount by collecting and transcribing more than 20 oral history interviews with former workers and families affected by the mill’s closure. 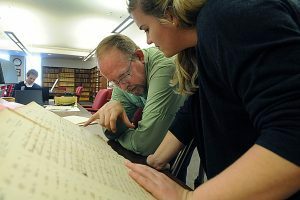 Last spring, they were recognized by the archivist of the United States through a grant from the National Historical Publications and Records Commission, and they have received additional support from Capitol Broadcasting to further their research. 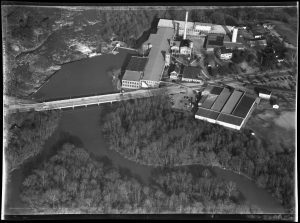 An aerial shot of Rocky Mount Mills circa 1953. (photo courtesy of Community Histories Workshop). They are developing a digital platform that will showcase the history of the mill and surrounding community with maps, photos and oral history interviews. They are also optimizing Prospect, a data visualization tool for use in community history and archiving. In partnership with Braswell Memorial Library in Rocky Mount, they have held several “history harvests”— sessions that offer community members an opportunity to digitally preserve and share their photos, home movies and community memorabilia. CHW members are also mining the University Libraries’ Southern Historical Collection for materials related to Rocky Mount Mills. Carolina K-12 (a program of Carolina Public Humanities) is using the “closing story” oral histories CHW has collected to develop lesson plans for 8th grade social studies teachers to enhance local and state history modules of the state curriculum. They will work together to organize a summer workshop for Nash and Edgecombe counties’ teachers to test these plans and to provide their input. John Mebane, president of the mill at the time of its closure, gave the CHW team invaluable insight into the demographic change in the mill’s workforce after the passage of the Civil Rights Act in 1964. Prior to the act, the only African Americans employed by the mill were a small number of men working on the loading dock. Three decades later, the workforce was nearly 80 percent African American men and women. 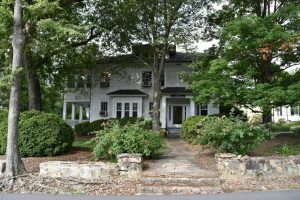 This information helped inform the direction of CHW’s efforts, said Nicole Coscolluela, project coordinator for the Rocky Mount Mills project. “The mill is very much ingrained into the story of labor history and race in Rocky Mount,” she said. Bernetiae Reed is another member of the CHW team. For over 30 years, she was a labor and delivery nurse before deciding to go back to school to pursue her passion for preserving African-American history. She received a master’s degree in library and information studies from UNC-Greensboro in 2015. She now works for the Southern Historical Collection and is part of the Mellon-funded Community Driven Archives Team. Reed has a personal connection to the Rocky Mount Mills story. The mill was founded in 1818 by Joel Battle, a local planter, and the Battle family had multiple ties to the University. Reed will be researching Battle family slave genealogies, trying to trace the lives of five slave families from the past into the present. “My great-great-grandmother was owned by the Battle family and taken into Texas, and then from there, into Louisiana,” Reed said. As they began a comprehensive new project, Allen and members of the CHW team visited the State Archives of North Carolina in December to explore materials related to Dorothea Dix Hospital, the state’s principal insane asylum from 1856 until it closed its doors in 2012. The City of Raleigh plans to develop 308 acres of the Dix campus into a destination urban park. 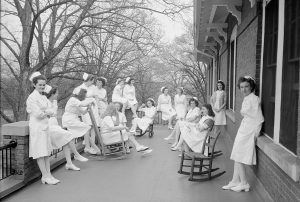 Aided by support from the Dix Park Conservancy Board, CHW is helping the board’s legacy committee chronicle the long history of the site, which extends at least 150 years prior to its use as an insane asylum. Their historical research will inform and inspire the master plan and programming of the future park and will be presented to the architectural firm, Michael Van Valkenburgh Associates. The CHW team will be combing through a red leather admissions ledger that lists every patient admitted to the hospital well into the 20th century; they’ll be exploring records from 1865 to 1917. Allen and team members are working on individual case studies, following patients through census enumerations, death certificates, digitized newspapers and other sources. Seniors Dani Callahan (history and global studies ’18) and Morgan Vickers (communication studies and American studies ’18) have been working on digital humanities projects with Allen since early in their academic careers. They serve as undergraduate research fellows with CHW. They both value the goal-oriented, collaborative work as well as the digital skills they’ve gained.The experience helped Callahan focus on how she could use her history degree to do something she’s passionate about. 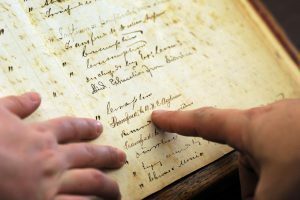 This spring, CHW is partnering with English and comparative literature professor Jordynn Jack’s medical humanities class to create a Dix Hospital learning experience based on the 19th-century admissions ledger.